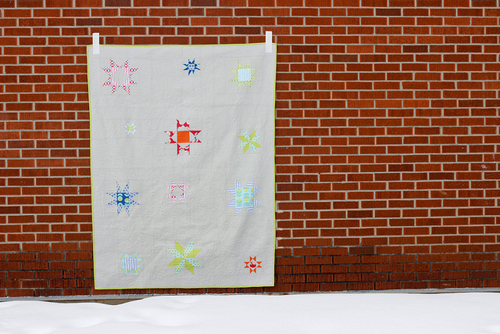 One of the workshops that I taught at QuiltCon last month was my Shining Stars Sampler Pattern. 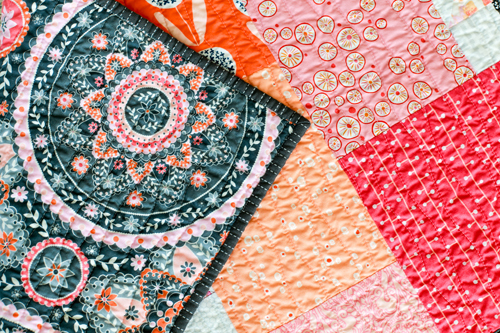 The pattern as written makes a generous 60" x 80" throw quilt. In case there were students who didn't want to commit to a full quilt, I wanted to share some alternative project ideas for the blocks. 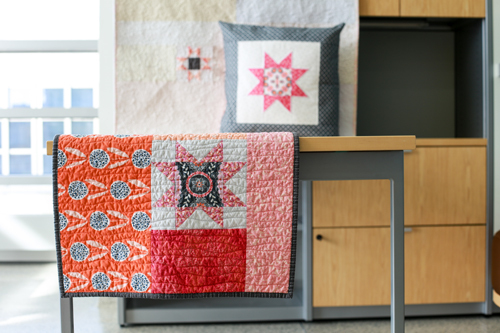 I made three projects: a baby quilt, a table runner, and a quilted pillow. Unfortunately, I realized while laying in bed the night before the workshop, that I left the projects at home! I was super bummed, but that's what the internet is for! I've been sharing each project on Instagram this week, but wanted to share them here as well in a bit more detail. The colors for these projects were all pulled from a small stash of prints from Jenean Morrison's 2011 collection, Silent Cinema. I've been hoarding this fabric for a while, and it seemed like a good time to finally use it. I pulled lots of other prints in these same colors, as well as a variety of low-volume prints. First up, the baby quilt! The pattern features three different block sizes, that in the end are all sashed out to be the same size. For the baby quilt, I used the smallest block size, and made four blocks. I used the same sashing pieces as called for in the pattern, but arranged them so that all the stars meet in the middle. 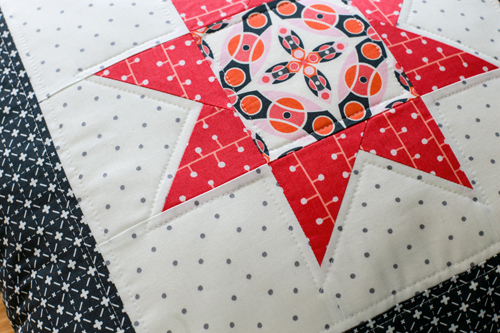 I made each star with two prints and used low-volume prints for the background and sashing. I wanted it to be a very soft quilt in terms of colors. 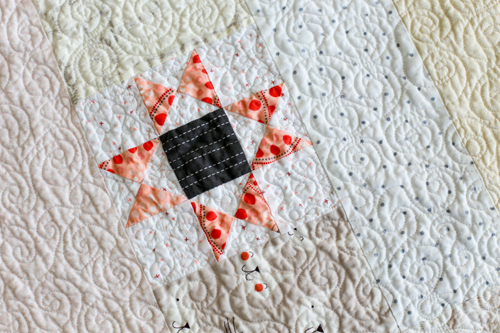 For the quilting, I quilted free-motion swirls in the sashing, and little tiny doodle loops in the background of each star block. 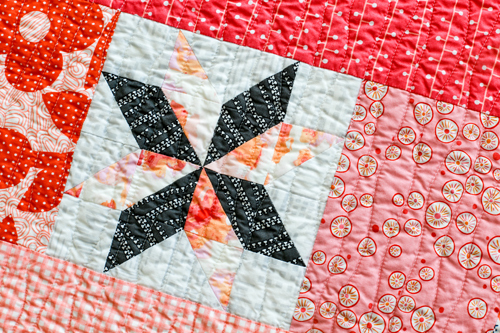 I left the prints in each star un-quilted so that they would really pop. I pieced together coordinating prints for the backing and bound it off in another soft low-volume print. 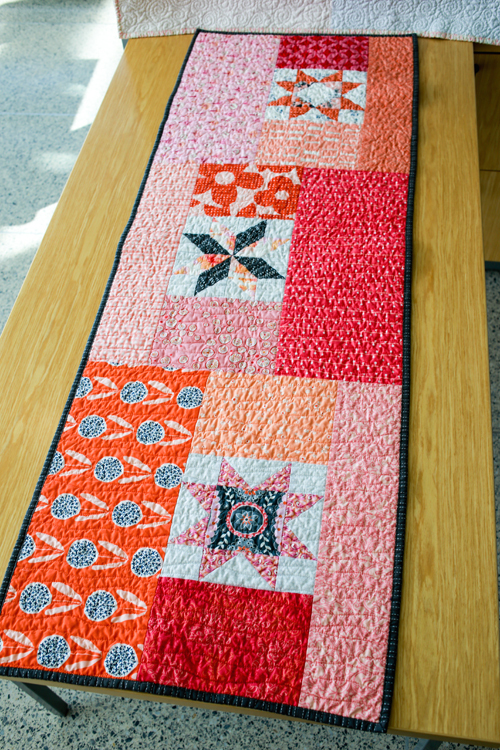 Next up, the table runner! For the table runner, I used three of the medium-sized star blocks. Again, I used two prints for each star, with a low-volume background. 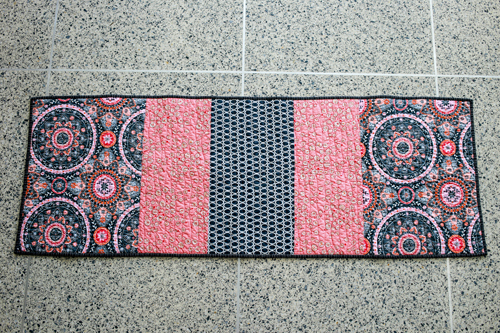 For the sashing on this runner, I used a variety of prints for each block to give it a different look. I also deviated from the pattern a bit by centering the stars in one direction. I went with my tried-and-true wavy line quilting for the runner. 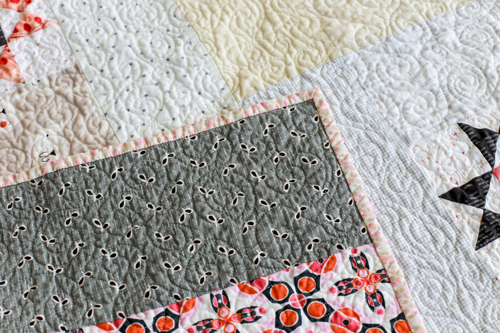 It's done with a walking foot, and you simply wiggle the quilt back and forth as you quilt. It's fun, and very forgiving. Plus it gives you such a nice crinkle once it's washed and dried! Again, I pieced prints for the backing. I finished it off with a gray binding. Finally, the pillow. I used one of the large blocks in the pattern for the pillow. I sashed it the same way as you would in the pattern if you were making the whole quilt. I used two prints in the star block and a low-volume for the background. I chose to use one sashing fabric versus multiple. I kept the quilting very minimal on the pillow. I outlined the star and outlined the border seams. 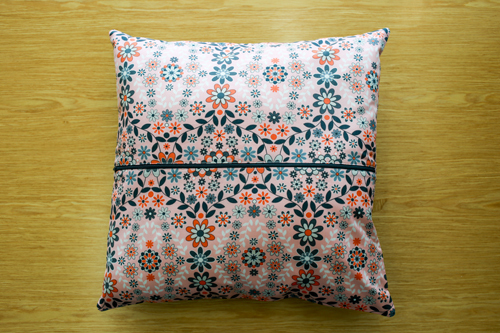 I finished it off by making a zippered back, which is my personal favorite way to finish off a pillow. I serged the seams on the inside to finish it off. 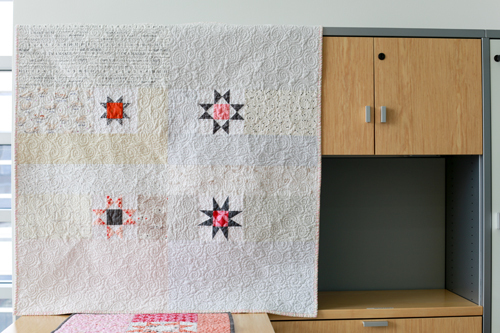 Last but not least, a parting shot of the full-size quilt! 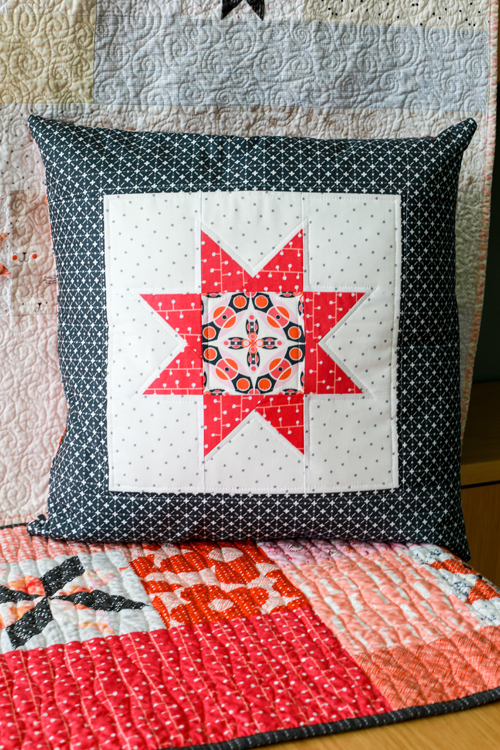 For more details on this quilt and the pattern, see this post. 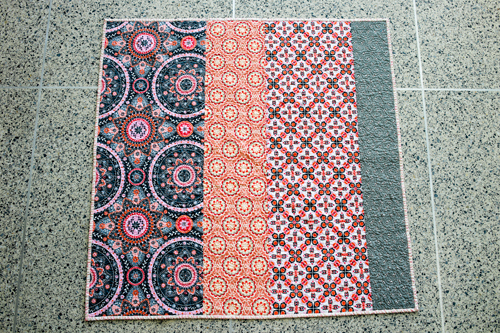 For the all solids version of this quilt I made last year, see this post. 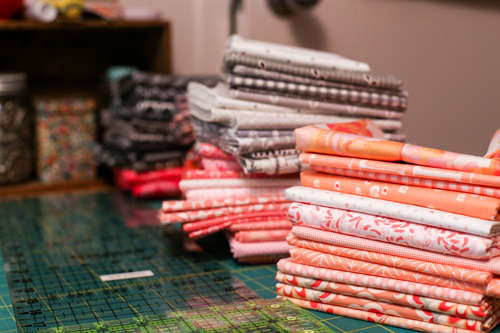 Such fun fabrics and projects! WOW Jeni, all of these look lovely. I love the pillow. Now I will make one for my sister bc I love her.